Apparently some sh*t’s going down on Saturday. Which is a dirty shame, because I was really looking forward to my Memorial Day weekend trip to Door County. Ah, well. Gypsy at Ravinia (2006): I recall it as my most happiest summer weekend ever. To be privilege to hearing Patti LuPone singing that score for the first time ever — in the front row, no less — and backed by the Chicago Symphony Orchestra with a rapt audience of fanatic Gypsy/Lupone/Sondheim fans and friends… It was quite the experience. Lots of wine, too. Hedwig and the Angry Inch at American Theatre Company (2008): Nick Garrison as Hedwig delivered one of the best performances I’ve seen an actor give on a Chicago stage. Hands down. And the production was first-rate, too. Grey Gardens on Broadway (2007): It’s rare for a role to fit a performer so perfectly, and by the time I saw Christine Ebersole’s Tony-winning turn in this musical, it was the last week of the Broadway run — and she was living it. Her final moments were so moving (particularly this song), it was like I made my own little rapture in my seat. In addition, Ebersole was sicker than a dog, but she still managed to bring it. And THAT is a star. Doubt with Cherry Jones (2007): Unlike the very flawed Grey Gardens, this taut one-act drama is pretty much perfection. You don’t need to have a blazing star performance from the incomparable Cherry Jones in order for the show to succeed. But it certainly helps. Caroline, or Change at Court Theatre (2008): Three words: E. Faye Butler. My first time seeing her in anything, and she set the bar really high. I want to see her tackle something this complex again. Not only was her performance remarkable, but the musical is also one of the most powerfully heartbreaking things ever. And Court’s staging was steller, filled with unexpected moments that took my breath away — such as after Butler ripped through the spite-filled “Lot’s Wife,” a solo clarinet began playing, a crack of thunder struck and it started raining onstage. As if to signify a cleansing of the spirits. Chills. Who’s Afraid of Virginia Woolf at Steppenwolf (2010): It’s all about Tracy Letts and Amy Morton. I’ve never heard a theatre so quiet than during the final moments of this Edward Albee classic, as reinvented by Steppenwolf. Ragtime at Drury Lane Oakbrook (2010): After I saw Drury Lane Oakbrook’s heart-stopping production, I went back the very next weekend and took people with. I just had to share this experience. This was one of the most expertly-staged productions of a musical I’ve seen in Chicago, thanks to the amazing director, Rachel Rockwel. A Little Night Music at Chicago Shakespeare Theater (2003): From the tuxedoed musicians behind a scrim, to the crisp, all-white settings, to the inspired casting of Barbara Robertson as Desiree (where I first fell in love with her), this was a perfect production. Simple, stylish, unexpected, sophisticated. I hope director Gary Griffin brings the same magic to Follies this fall at CST as he brought to Night Music. 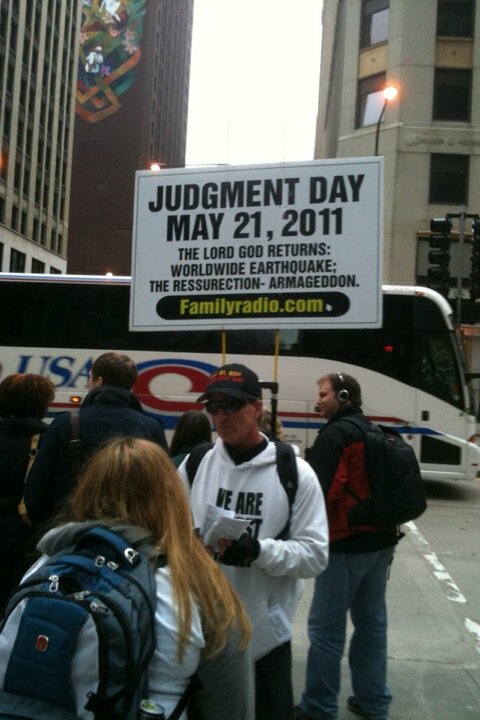 Oh, wait… the Rapture. Damn. Le Grand Macabre at Theater der Stadt Heidelberg (2000): When I lived in Heidelberg, Germany for six months, I saw lots of crazy modern operas. György Ligeti’s dark, absurdist opera took the cake. So fitting for this list, as it was about the impending doom of the world and all its crazy sinners, and two lesbians who managed to escape disaster because they fell into an empty grave. Or something. I can’t really remember all the details, but I saw it twice. And there was a really creepy overture played with car horns and door bells. The Pillowman at Redtwist Theatre (2009): Martin McDonagh’s The Pillowman is an uncomfortable piece of theater, and Redtwist’s intense and claustrophobic production is seared in my brains. Cats on Broadway (1988); Phantom of the Opera (1994ish) and Sunset Boulevard in Toronto (1996): Don’t laugh. Cats and Phantom were my first exposures to big, professional theatre, and I was obsessed with them for years. To ignore that would be silly. And Diahann Carroll as Norma Desmond was my first full-out diva performance. She wasn’t the most ideal Norma, but she commanded that huge stage with the kind of controlled, old-school star power that’s so rarely seen. There’s so many more, but I’m running out of time. I mean, with the world ending and all I have much more pressing things to do than blog. Toby and Leo can hang out after the Rapture. Don’t worry- they are CONFIRMED atheists. $135 per dog? Wow – these people are brilliant! I include that weekend of Gypsy at Ravinia too! It was the first time I met you and yours and it was just one of those perfect weekends all around!